In this post, you will find basic player statistics and goalscoring information after Week 5 of the Nigeria Professional Football League 2013. All players mentioned have played at least one match, or been on the bench at least once, during the first five matches. 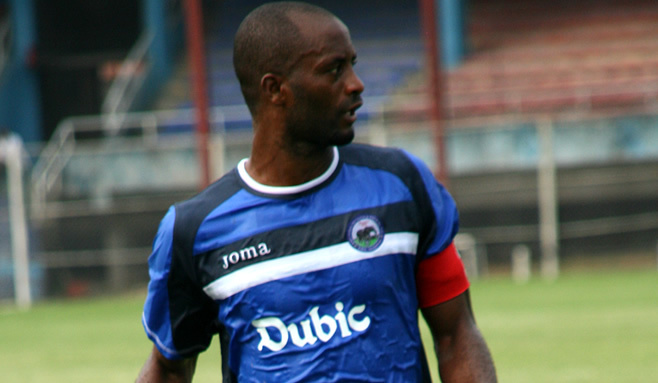 The picture is of centre-back Chinedu Udoji, the impressive captain of Enyimba FC. The picture was found on www.enyimbafc.net, a site worth a visit. * Stylish midfielder Ter’ade Ichull Lordson has been amazing. The 19-year old, a product of the Kwara Football Academy, is a powerful holding midfielder who fights for every ball. Lordson is also a set-piece expert and his three goals have been scored through two penalties and one top-shelf free-kick. * Goalkeeper David Walbe, left-back / left-winger Idris Aloma and centre-back Chinedu Ajanah have all been praised for their performances this season. Unfortunately, star striker Abdulrahman Bashir is struggling in front of goal and has failed to score in five matches. * Ubong Ekpai is the star striker at Akwa United FC. Ekpai, who scored only three goals during the Nigeria Premier League 2012, is one of few current players who featured for the club in their promotion season back in 2010-2011. * Adama Ada Odey, formerly of Heartland FC, is doing well at the left-back position. Edo Nnamso is a quality right-back and Gwaza Iorliam (signed from Niger Tornadoes FC), Dimka Monayan (formerly of Gombe United FC and Plateau United FC) and Nura Nakargo are all towering central defenders. Nakargo is also effective in a defensive midfield role. Ini Akpan has been captaining his team from various attacking roles and Sarafa Usman has been wonderful at left-wing or behind the strikers. Young striker Mfon Udoh could be a player to watch. * Enyimba FC is struggling in front of goal. Sibi Gwar, who scored 16 goals for Niger Tornadoes FC last season, only has a penalty goal to his name. Big-name signing Andrew Abalogu, who scored nine goals for ABS FC last season, has showed a lot of quality but been ineffective in front of goal. It could be a smart move to use target-man Ukeyima Akombo, as this could create space for smaller players such as Gwar and Abalogu. Akombo could also be the target for crosses from the lively attackers Chime Amanfor and Chinonso Okonkwo. * Enyimba FC has signed a new Cameroonian striker called Franck Banini. Franck Banini, also known as Franck Ngweha Banini, is born 07.12.1991 according to the following clip from YouTube: http://www.youtube.com/watch?v=Ehv5Mtbf2RU. The clip shows Banini playing in the red / green outfit of Canon de Yaoundé. Personally, I have never heard of a “Franck Banini” at Canon de Yaoundé. However; a striker called “Jean Philémon Banini Nyobe” played for Canon de Yaoundé during the MTN Elite One 2009-2010. Banini Nyobe has played for Esentepe SK at Northern Cyprus and is registered with the birthdate 07.12.1987. In other words, both players are born on December the 7th. This could of course be a coincidence. i’m a footballer jst admiring d league 4 d 1st time. May God help us so dat our football wil develop 2.